When my father moved to Cornwall, during the years I lived in London more than two decades ago, most of my trips down to see him involved bringing my bike, and grovelling up and coasting down the endlessly folding land around his house: the green hills, narrow lanes and tall hedgerows tucked below the higher, bare uplands of Bodmin moor to the west and Dartmoor to the east. The girlfriend I had at the time (who was indirectly fairly responsible for my move towards Buddhism – though that is another story), was very keen on walking, and some summer days we would be out for hours on foot, from Calstock to St Neot, Crow’s Nest and Minions, Harrowbarrow and Golitha Falls. On summer days we would sometimes find wild strawberries in the hedgerows. We covered much of the same ground as I did on my bike, but also followed riverside footpaths, and other old, half-forgotten rutted tracks between fields. When I run in Cornwall these days, I carry those memories, as well as the fainter memories from knowing that generations of my family walked the same routes before me. Running up Kit Hill, with its views across both moors and down to the sea at Plymouth; running what was referred to as ‘the square’ when my father could walk his dog longer distances, towards town, down little lanes to the stream, and back via the recently harvested woods next to the mill; running over a couple of hills to take the path alongside the beautiful Lynher at Kersey Bridge; a final run further downstream through a wooded glade and then back over Cadsonbury – I feel so much resonance from a very close and personal history. By contrast, on Tuesday morning in London, staying with my friend who was visiting from Geneva, I took a run at first light, along the river from Vauxhall Bridge to Parliament Square, then looping around the four parks that cut a large green swathe through that part of the city. In the course of ninety minutes, I passed so many historical places and landmarks that signalled Britain’s former imperial power and status: Westminster Abbey, the Houses of Parliament, Buckingham Palace, Hyde Park Corner, Rotten Row (with a number of horses being exercised), the Royal Albert Hall and the Albert Memorial, Kensington Palace, Marble Arch, Speakers’ Corner, Park Lane, Piccadilly, St James Palace, the Mall, Horse Guards Parade, the back of Downing Street. In the meantime the city was getting busier, and noisier. I could taste the pollution closer to the roads, and was glad to get away from them, among the many cyclists and runners in the parks. There was a striking sunrise, though unfortunately I had my back to it at its peak. From London I took the first of five flights in the course of ten days (visiting four of London’s airports in the process) over to Belfast to spend a couple of days with Djinn and Richard. 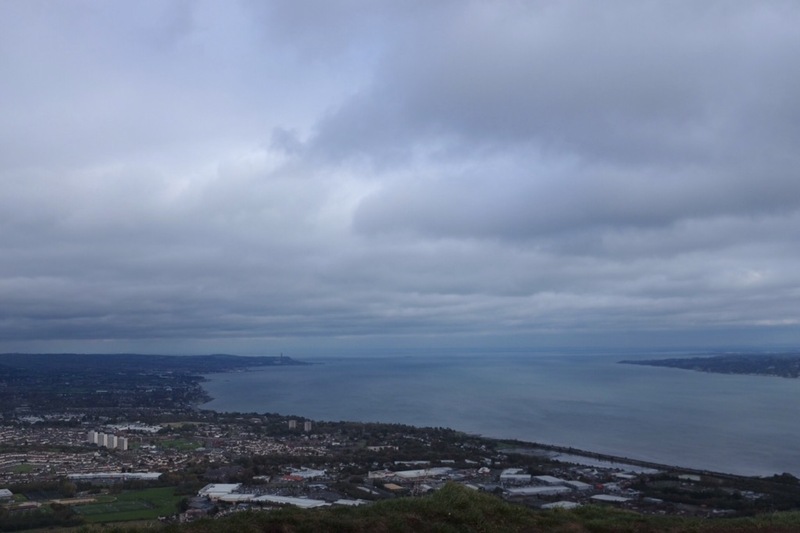 On Wednesday Djinn and I walked up Cave Hill, with long views right across the water to Scotland, and south to the cloud-topped Mountains of Mourne. I had an urge to try to run the loop that we walked, but was feeling the London run in my legs still, so did not get too attached to the idea. It turned out that I was there for Djinn’s ‘weekend’, when she does not lead the sitting at Black Mountain Zen Centre, so there was less practice on this visit than I might have expected. On the other hand, Djinn and Richard hosted a dinner on my first evening, with one couple I know and like, and another related couple that I was meeting for the first time. The evening was very voluble, without a drop of alcohol being involved, and I got another crash course in current Irish politics and the lingering effects of the sectarian violence. The next evening we went to see a film about the famine in the south of the country, where the English played the indisputable villains – the kind of history that I did not get taught in school across the water. 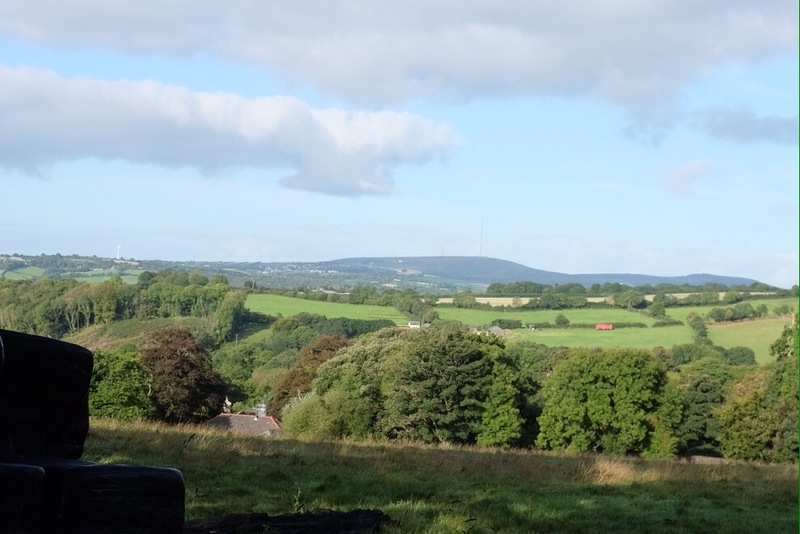 I did not venture far afoot with my camera in Cornwall this time, but this is looking over to Caradon Hill from close to my father’s house. 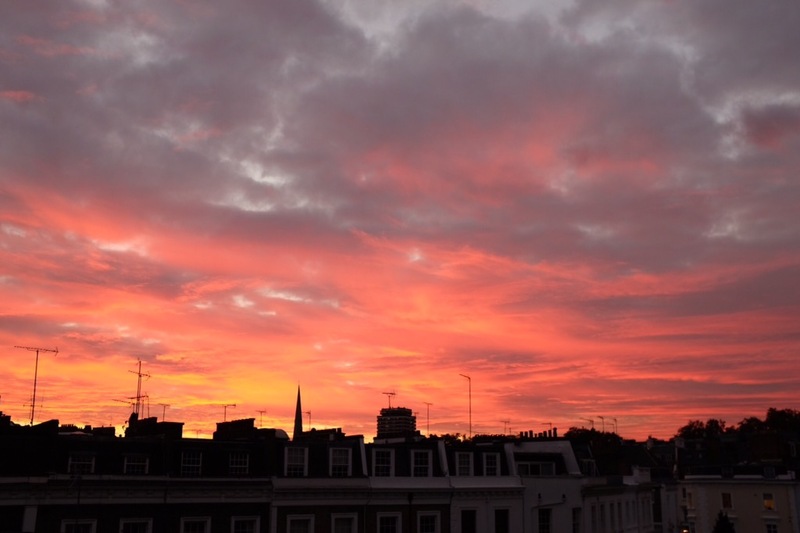 There were remarkable sunrises and sunsets in my two days in London earlier in the week. Scotland is faintly visible in this view from McArt’s Fort on Cave Hill. 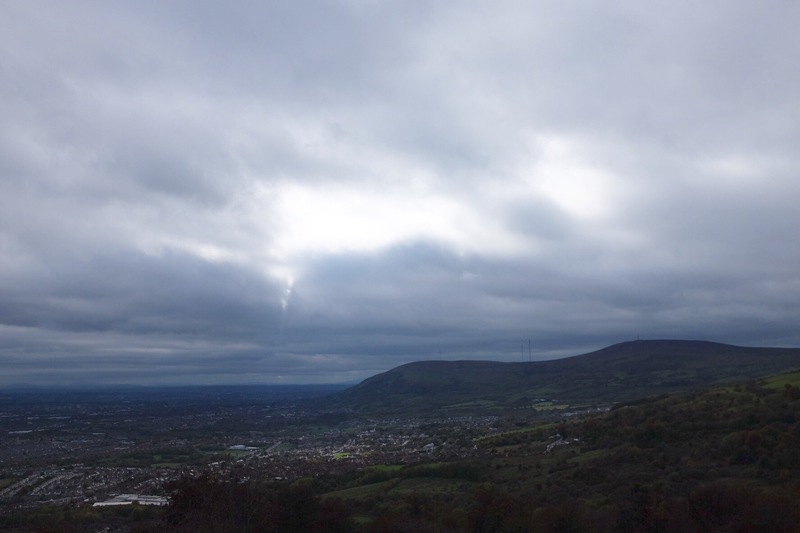 Looking over Belfast to Black Mountain from Cave Hill.